Everyone who lives or works in Mount Baker is a member of the Mount Baker Community Club. Volunteers keep the Club working; but contributions from community residents help pay for heating, lights, toilet paper, and the people who open our doors, maintain our website, keep our books, and tend the kiosk. The generosity of past supporters has ensured that our programs, community outreach, and the clubhouse remain available to all residents of our neighborhood. Everybody GIVES so everybody GAINS! The Annual Fund supports community programming, outreach, and Clubhouse operations. THANK YOU to all who have generously given to the 2018 Mount Baker Annual Fund! DONATE ONLINE. By giving to the Community Club, you help ensure that Mount Baker remains a strong, vibrant neighborhood—one with a centrally located, historic Clubhouse with seminars, workshops, community forums, art performances, classes, and programs that appeal to our community's diverse interests. Please consider making a donation to keep our historic Community Club the hub of our neighborhood. Download the annual fund form. Have you considered making your gift last beyond your lifetime? By making a bequest to MBCC in your Will, your support of the Club can become your legacy to the community long into the future. Read more about legacy giving. • Community Meetings. Discuss & learn about issues affecting our community — public safety, education, zoning and development, transit service, parks and playgrounds. • Annual events where all are welcome. The Community Potluck where we welcome new neighbors and renew longtime friendships; the Christmas Ships Celebration at the Clubhouse and bonfire on the beach; and the Day in the Park Festival in Mount Baker Park. Gifts of all sizes are appreciated and are fully tax-deductible. 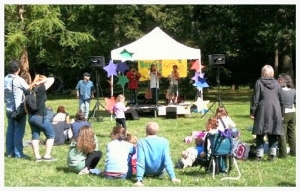 • Sponsored programs like the Mount Baker Home Tour, Kindiependent Kids Rock Series, Pied Piper family events, and movie nights. • Our newsletter, The Mount Baker View, a printed community newsletter featuring neighborhood news, commentary, and a calendar of events for all 5,000 households in our area — at no cost to residents. AND, membership is completely free to everyone who lives, works and goes to school in Mount Baker. We have no dues! We depend on the generosity of our neighbors to fund all the wonderful things the Community Club does for the neighborhood. Please give to our annual fund or make a one time donation now.